Our California Basics Beer Bottles feature incredibly high-quality glass bottles perfect for any avid homebrewing hobbyist. Whether making your own kefir, craft beer, kombucha, or soda, our bottles make it easy to store your tasty beverages. Each bottle comes with its own reusable and easy-to-remove fliptop cap so that you can reuse your bottle over and over again. HOMEBREW FRIENDLY: Whether you're brewing craft beer, kombucha, kefir, or soda, these glass bottles make it easy to carry out your latest beverage project. At 16 ounces per bottle, you'll have plenty to serve at your next party. SAFELY PACKAGED & REUSABLE: Each set comes safely packaged to prevent breakage while shipping. Each bottle is made of glass and can be reused again and again. Bottles are dishwasher safe. DURABLE & RESEALABLE CAPS: Plastic & rubber fliptop gaskets are easy to remove and put on, keeping your homemade beverages sealed and preserving carbonation or any other fermentation. PACK OF 6 OR 12: Are you an avid homebrewing pro? Save money by buying in bulk. 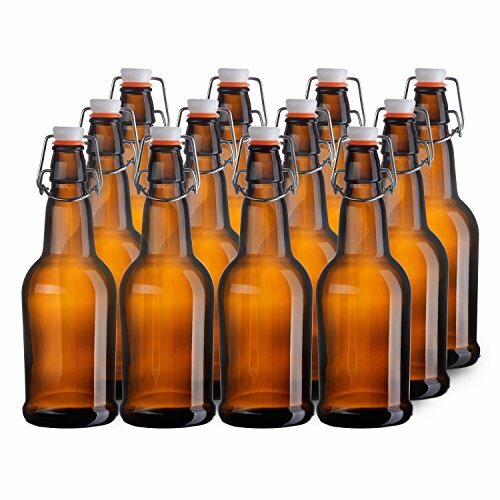 We offer our customers a choice of a set of 6 or 12 longneck beerbottles per set. 30-DAY SATISFACTION GUARANTEE: Your happiness is our priority. If you have any issues, reach back out and we'll promise to make it right with a refund or a replacement, no questions asked.